Family historians get excited about discovering stories about their ancestors lives – and rightfully so. Those stories paint a vivid picture of the ancestor’s personality, opinions, and experiences. Unfortunately, some people who aren’t interested in genealogy or family history may think that listening to old stories is boring. They may bristle at listening to the story you are motivated to share with them. One way to get them used to the idea that family history can, in fact, make for a great story is to share some examples that have been posted on news websites. They can read the story in their spare time, and perhaps enjoy it. Family historians can benefit from reading other people’s family stories, too. It is a good way to learn how to present an interesting story. Gene O’Lowgee wrote about his family for the Historical Society of Pennsylvania. “Kinfolk – A Personal View by Gene O’Lowgee”. He shares what his parents were like when they were young. The article includes images, including one of his father that “struck a chord” for him. In part of the article, he talks about his mother and her joy of reading. Ian Shapira wrote an article for The Washington Post titled: “Americans gave their lives to defeat the Nazis. The Dutch have never forgotten”. In the article, there is a description of a cemetery’s annual commemoration, and the history that led up to it. 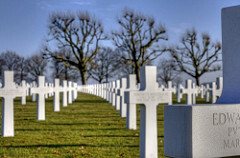 The article includes stories from individuals who visited and/or tended The Netherlands American Cemetery in Holland. There is also information about some of the people who are buried in there. One cannot help but become emotional while reading this unique family history story. Toby Wadey wrote an article for the BBC News titled: “The German and British children who became post-war friends”. In the article, there is the story of Gretal Reiber and June Whitcomb, who became “sisters” in 1947. June was 13 years old, and an only child. She lived in Reading, Berkshire. Her parents read in the newspaper that German children were starving. June’s parents were determined to help. Gretel Reiber was 12 years old and living in Dusseldorf, Germany. She was pulled out of the classroom at school and sent to England to be cared for by June’s parents. The two girls shared clothing and became “sisters.” Years later, they are still close. Image by Bert Kaufmann on Flickr.